With school in full session, that means the full range of school-related illnesses are back as well. Though it sometimes may not seem like it, school can be one of the best ways to expose your kids to germs so that they get used to it. Unfortunately, there are other epidemics that go around schools, like lice. What is lice? If you need a refresher, lice are insects that live on human scalps and feed off human blood. Female lice lay up to ten eggs a day, and if your child is hard to get into the shower, those lice can seemingly multiply even faster. Due to the close confines of school, lice spreads quickly, so once you discover it, get your kid out of school! One common treatment is the light & comb method. Using a flashlight and a special lice comb, comb out the afflicted person’s hair (while it’s wet) and make sure to look for signs of lice and their eggs. 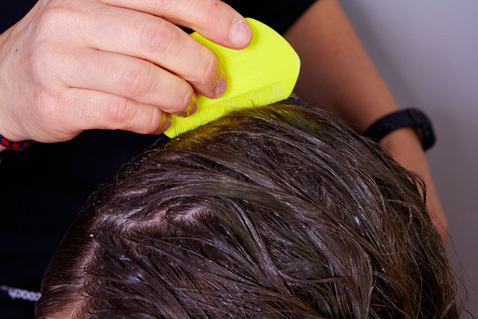 Not only does this diagnose lice, if you do it correctly, it also helps to remove them. Another treatment is the home-wrecking method; after you’ve removed the lice from hair, wash everything that was used during the lice infestation. This resets the area, and will hopefully prevent re-infestation. There are prescription medicines you can use for lice, but many of them have serious side-effects or have been proven to be less effective that it’s best to stick to the above methods. If it seems to be a prolonged case, then seek medical treatment.